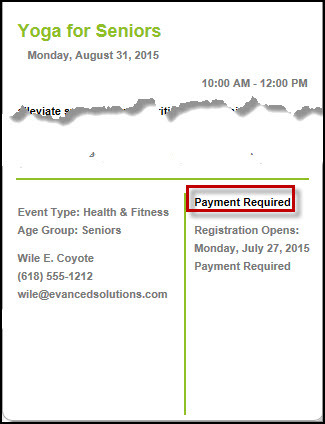 After completing the Registration step of event creation, Payment notifications can be added. Patron Classifications will need to be supplied to Evanced Support to be added to your site. They can be fixed or editable. Registration is required for payment to be enabled. On the Calendar view a $ icon will appear noting the Required Payment and a note will appear that payment must be made to the library. Posted - Fri, May 4, 2012 at 1:25 PM. This article has been viewed 2215 times.